With 3600 works to his credit, Georg Philipp Telemann is rightly regarded as of one of the most prolific composers of all time. However, this superlative has brought him less honour than one may have hoped, because with so many works came the suspicion that quality may have been sacrificed in the process, a view that prevailed especially throughout the 19th century. As a result, the objective study of Telemann and his protean work only began in earnest in the late 20th century, resulting in many discoveries and first performances that show the seriousness and depth of the composer�s genius. 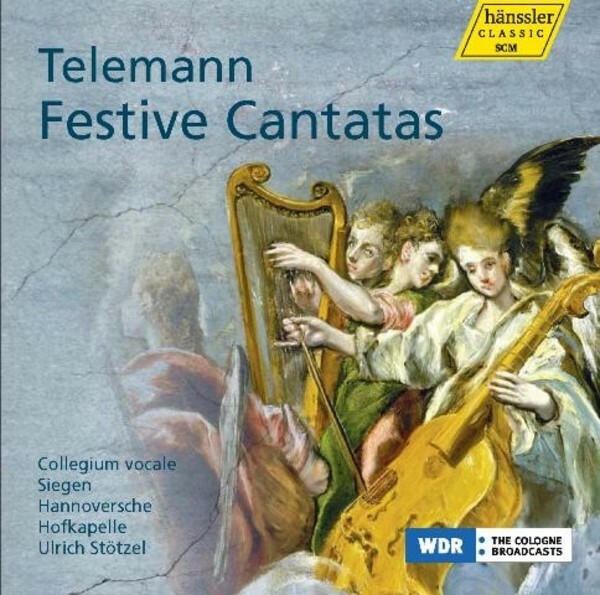 The present CD features a trio of cantatas from the so-called 'Engel-Jahrgang' (lit. 'Angel cycle', named after the image of an angel that appears on the cover of the printed scores) dating from 1748/49. In these works, Telemann has already begun to explore the Rococo style, which had just begun to take root and demonstrates his compositional skill and originality at every turn. Three festive cantatas ring out in glorious tones: Der Herr lebet for the first day of Easter, Ehr und Dank sey Dir gesungen for the Feast of St Michael and Der Geist giebt Zeugnis for the Day of Pentecost. The Collegium Vocale Siegen, the Hannoversche Hofkapelle, singers Miriam Feuersinger, Franz Vitzthum and Klaus Mertens and director Ulrich St�tzel are in their element with Telemann - having previously released several Telemann albums with H�nssler Classic � and present another instalment of enchanting and accomplished performances of rarely heard music from one of the greatest masters of the Baroque.